MidWest Outdoors Website Design Project by Metal Potato! 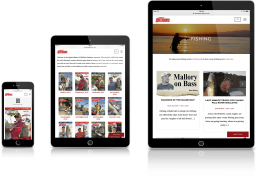 Television, print and online media — Midwest Outdoors has it all. For 30 years, Midwest Outdoors (MWO) has drawn outdoorsmen from the heartland of the United States to their shows and magazines with a combination of outstanding content and beautiful presentation. But until recently, their website looked every bit of 30 years old. Now, it’s one of the most modern websites in the outdoor media industry. In late 2015, MWO was acquired by new ownership, and that new ownership had a plan: modernise for the digital world. Soon after, they approached us with two goals: step one, build a stop-gap website that would at least bring them up to speed with a mobile-friendly, responsive layout; step two, create a long-term website that might (they hoped) be ready by summer of 2016. Never ones to sit around and wait, our team delivered a full-fledged responsive website built specifically around their needs in about six weeks. Summer of 2016? Pssht. MidWest Outdoors was so impressed with the “stop-gap” website that they decided there was no need for a second build… in other words, we hit the nail on the head the first time. The site is flush with mobile-friendly video, podcasts, digital articles, a fully functional eCommerce store, and more. Getting it there wasn’t easy: it necessitated the largest server move in our history, a project that encompassed over 100 email accounts, onto our Potato Care hosting platform. But it’s here. It’s ready. And it’s all in time for the dawn of the New Year. You have probably heard the old business adage: “There’s service, quality and price. Pick two.” Metal Potato is the rare company that offers all three. But here’s something you probably haven’t heard: My website design company delivered a great project on time.